Epic Armoury Entry Level is a new concept that will see an Epic Armoury sword be dropped to a price point like that of RFB weapons, the swords offered will change from time to time, but there will always be a sword available. Since Ready For Battle was not designed with a sword length above 75cm in mind, we have decided to take a 80-95cm sword and 100-110cm sword and set them at a price that is comparable to Ready for battle. This means that an Epic Armoury branded weapon has been given a steep discount. Your normal discount still applies. 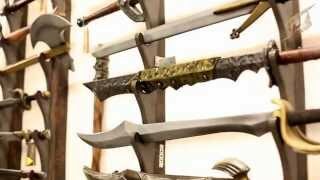 Epic Armoury Entry Level are for those, that are looking for a medium length sword (about 80 - 95 cm) or a long length sword (about 100 -110 cm) at an attractive entry level price. The RFB swords are build with a focus on being safe and absorb a large portion of the impact from the blow. This is made possible by building the sword around a very flexible, but strong core. The flexible core causes the blade to have a certain amount of wobble during powerful strikes and blows, which results in you have less control during your swings. The softer foam in the blade, and especially in the handle, means that you receive less recoil in your sword arm and shoulder. Besides being build with safety and durability in mind, Epic Armoury swords are build with a focus on handling and control. This is achieved by building the sword around a thicker and less flexible core resulting in less wobble during powerful strikes and blows. In addition to this newer Epic Armory swords comes with a balanced handle for extra control. The Epic Armoury Entry level, we will always guarantee at least one sword of medium length and one sword of long length at a price point that is hard to match anywhere else. To make it short and simple: The Epic Armoury Entry-level concept gives you an Epic Armoury sword at a Ready For Battle price.